Tachycardia, also called tachyarrhythmia, is a heart rate that exceeds the normal resting rate. In general, a resting heart rate over 100 beats per minute is accepted as tachycardia in adults. Heart rates above the resting rate may be normal (such as with exercise) or abnormal (such as with electrical problems within the heart). Heart rate is considered in the context of the prevailing clinical picture. For example: in sepsis >90 bpm is considered tachycardia. When the heart beats excessively or rapidly, the heart pumps less efficiently and provides less blood flow to the rest of the body, including the heart itself. The increased heart rate also leads to increased work and oxygen demand by the heart, which can lead to rate related ischemia. Relative tachycardia involves a greater increase in rate than would be expected in a given illness state. Tachycardias may be classified as either narrow complex tachycardias (supraventricular tachycardias) or wide complex tachycardias. 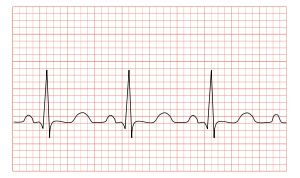 Narrow and wide refer to the width of the QRS complex on the ECG. Narrow complex tachycardias tend to originate in the atria, while wide complex tachycardias tend to originate in the ventricles. Tachycardias can be further classified as either regular or irregular. The body has several feedback mechanisms to maintain adequate blood flow and blood pressure. If blood pressure decreases, the heart beats faster in an attempt to raise it. This is called reflex tachycardia. This can happen in response to a decrease in blood volume (through dehydration or bleeding), or an unexpected change in blood flow. The most common cause of the latter is orthostatic hypotension (also called postural hypotension). Fever, hyperventilation, diarrhea and severe infections can also cause tachycardia, primarily due to increase in metabolic demands. An increase in sympathetic nervous system stimulation causes the heart rate to increase, both by the direct action of sympathetic nerve fibers on the heart and by causing the endocrine system to release hormones such as epinephrine (adrenaline), which have a similar effect. Increased sympathetic stimulation is usually due to physical or psychological stress. This is the basis for the so-called fight-or-flight response, but such stimulation can also be induced by stimulants such as ephedrine, amphetamines or cocaine. Certain endocrine disorders such as pheochromocytoma can also cause epinephrine release and can result in tachycardia independent of nervous system stimulation. Hyperthyroidism can also cause tachycardia. The upper limit of normal rate for sinus tachycardia is thought to be 220 bpm minus age. Ventricular tachycardia (VT or V-tach) is a potentially life-threatening cardiac arrhythmia that originates in the ventricles. It is usually a regular, wide complex tachycardia with a rate between 120 and 250 beats per minute. This is a type of tachycardia that originates from above the ventricles, such as the atria. It is sometimes known as paroxysmal atrial tachycardia (PAT). Several types of supraventricular tachycardia are known to exist. Atrial fibrillation is one of the most common cardiac arrhythmias. In general, it is an irregular, narrow complex rhythm. However, it may show wide QRS complexes on the ECG if a bundle branch block is present. At high rates, the QRS complex may also become wide due to the Ashman phenomenon. It may be difficult to determine the rhythm’s regularity when the rate exceeds 150 beats per minute. Depending on the patient’s health and other variables such as medications taken for rate control, atrial fibrillation may cause heart rates that span from 50 to 250 beats per minute (or even higher if an accessory pathway is present). However, new onset atrial fibrillation tends to present with rates between 100 and 150 beats per minute. AV nodal reentrant tachycardia (AVNRT) is the most common reentrant tachycardia. It is a regular narrow complex tachycardia that usually responds well to the Valsalva maneuver or the drug adenosine. However, unstable patients sometimes require synchronized cardioversion. Definitive care may include catheter ablation. The management of tachycardia depends on its type (wide complex versus narrow complex), whether or not the person is stable or unstable, and whether the instability is due to the tachycardia. Unstable means that either important organ functions are affected or cardiac arrest is about to occur. In those that are unstable with a narrow complex tachycardia, intravenous adenosine may be attempted. In all others immediate cardioversion is recommended. The word tachycardia came to English from New Latin as a neoclassical compound built from the combining forms tachy- + -cardia, which are from the Greek ταχύς tachys, “quick, rapid” and καρδία, kardia, “heart”. As a matter both of usage choices in the medical literature and of idiom in natural language, the words tachycardia and tachyarrhythmia are usually used interchangeably, or loosely enough that precise differentiation is not explicit. Some careful writers have tried to maintain a logical differentiation between them, which is reflected in major medical dictionaries and major general dictionaries. The distinction is that tachycardia be reserved for the rapid heart rate itself, regardless of cause, physiologic or pathologic (that is, from healthy response to exercise or from cardiac arrhythmia), and that tachyarrhythmia be reserved for the pathologic form (that is, an arrhythmia of the rapid rate type). This is why five of the previously referenced dictionaries do not enter cross-references indicating synonymy between their entries for the two words (as they do elsewhere whenever synonymy is meant), and it is why one of them explicitly specifies that the two words not be confused. But the prescription will probably never be successfully imposed on general usage, not only because much of the existing medical literature ignores it even when the words stand alone but also because the terms for specific types of arrhythmia (standard collocations of adjectives and noun) are deeply established idiomatically with the tachycardia version as the more commonly used version. Thus SVT is called supraventricular tachycardia more than twice as often as it is called supraventricular tachyarrhythmia; moreover, those two terms are always completely synonymous—in natural language there is no such term as “healthy/physiologic supraventricular tachycardia”. The same themes are also true of AVRT and AVNRT. Thus this pair is an example of when a particular prescription (which may have been tenable 50 or 100 years earlier) can no longer be invariably enforced without violating idiom. But the power to differentiate in an idiomatic way is not lost, regardless, because when the specification of physiologic tachycardia is needed, that phrase aptly conveys it. ^ a b Awtry, Eric H.; Jeon, Cathy; Ware, Molly G. (2006). Blueprints cardiology (2nd ed.). Malden, Mass. : Blackwell. p. 93. ISBN 9781405104647. ^ Custer JW, Rau RE, eds. Johns Hopkins: The Harriet Lane Handbook. 18th ed. Philadelphia, PA: Mosby Elsevier Inc; 2008. Data also available through eMedicine: Pediatrics, Tachycardia. ^ a b c d e f Neumar RW, Otto CW, Link MS, et al. (November 2010). “Part 8: adult advanced cardiovascular life support: 2010 American Heart Association Guidelines for Cardiopulmonary Resuscitation and Emergency Cardiovascular Care”. Circulation. 122 (18 Suppl 3): S729–67. doi:10.1161/CIRCULATIONAHA.110.970988. PMID 20956224. ^ Elsevier, Dorland’s Illustrated Medical Dictionary, Elsevier. ^ Merriam-Webster, Merriam-Webster’s Medical Dictionary, Merriam-Webster. ^ a b Wolters Kluwer, Stedman’s Medical Dictionary, Wolters Kluwer. ^ Merriam-Webster, Merriam-Webster’s Collegiate Dictionary, Merriam-Webster. ^ Merriam-Webster, Merriam-Webster’s Unabridged Dictionary, Merriam-Webster.